Hi All. I recently moved to a house that has an insolated garage so I have decided to get back into kegging. I don't really have the space to put the fridge inside. I use a Johnson Thermostat to control fermentation temps usually. It has been warm with temps around 80F in the garage. With the temp set at 50F the fridge seems to run continuously during the day. I would like to set it lower but really don't want to waste the energy/$. Any tips on making the fridge run more efficiently? I understand that there is not very much I can probably do. It will be starting to cool down here soon so it shouldn't been an issue for toom much longer. I only have one corny in there currently so I just placed a 6.5 gallon bucket of ice water next to it and loaded the doors with bottled homebrew. I don't think it should run continuously. That sounds like something is wrong. Are the coils clean? I'd start there. If the coils are not clean it will not be running efficiently. Yeah that was the next thing I was going to check. I shouldn't say that it is running continuously but it is definitely running a lot more than it is not. Try putting the probe in a liter of water. I did that with mine. It runs longer, but less often. Before it ran 5 minutes an hour. Now it runs 10 or so every few hours*. *Figures are completely anecdotal. 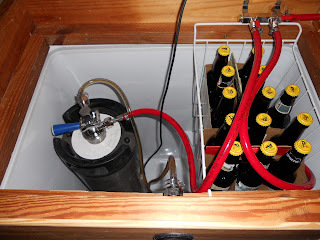 I do not care enough to actually time my kegerator. My kilowatt tells me it cost $4.00 a month. So I got that going for me. Thanks for the advice. Coils definitely were not clean. They are on the bottom so I used the shop vac to get what I could. Probably need to do some more but its a start. I had to use my air compressor to blow the dust off the coils on my fridge. I also rigged up a airlock and a hose on the end of the shop vac to get way under and into the coils. Good air ventilation will help the coils too. If they're in a tight spot, a small computer fan might help. +1. A compressor gets them nice and clean. Thanks all. I think I need to take some time to empty it, tip it on its back, and clean it really well. The amount of cleaning I did on the coils seems to not have made much of a difference. Careful with tipping it (and not just on account of the weight). If you do, wait 30 minutes or so before you turn it back on. There's some issue with oil in the compressor. I can't recall if it gets in the coolant lines or something like that, but you definitely want to wait to turn it back on to let the fluid re-settle. Is the fan in the fridge/freezer working? Yes I can feel cold air blowing into the fridge. time to make or buy more beer. A full fridge is a happier fridge, and it runs less overall because there is more mass in the fridge that stays at a more constant temp than the air in an empty fridge...or so I have been told. Keep those coils clean is the most important thing, though.